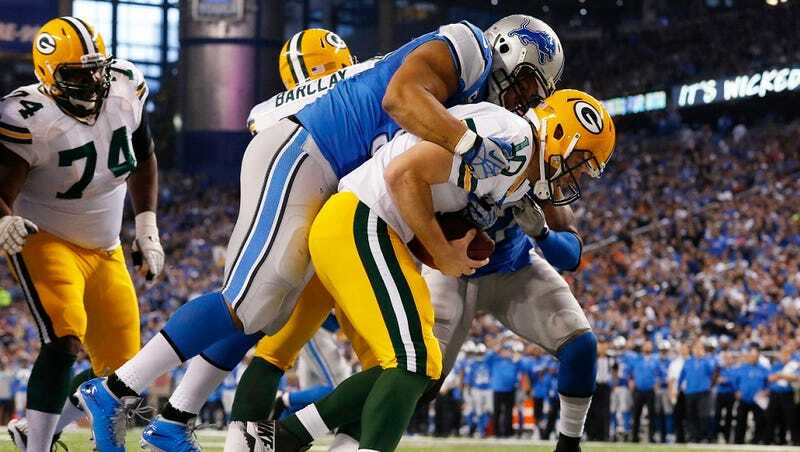 The Green Bay Packers allegedly played the Detroit Lions this afternoon, in a rematch of a Jan. 1, 2012 game in which the teams combined for a Packers team single-game record 1,125 yards. In that game, Detroit racked up 575 yards (Matt Stafford threw for 520 yards) while Green Bay rolled up 550 (Matt Flynn threw for 480 yards and six touchdowns) on the way to a 45-41 win. Today the Lions held up their end: 561 total yards (Matt Stafford threw for 330 yards) while Green Bay rolled up ... 126. Matt Flynn actually threw for 139, or more than his team accumulated in total. The Lions won 40-10. Before a 70-yard final (pointless) drive, the Packers had 56 yards. Had it stood, that total would've been the second-worst offensive day in the history of the team. The worst was 36 yards at Cincinnati in 1976 (71 rushing yards, minus-35 passing). The next-worst was 61 at the Boston Redskins in 1934 (55 rushing yards, 6 passing). Infamy will follow the Packers, who didn't win once in five November games, after this line: 126 yards (24 rushing yards, 102 passing). But at least this low is not, after all, a new one.